Foundations constructed by increasing the are at the base of the structure by means of offsets, are called spread footing foundations. In such foundations, spread is given under the base of a wall or a column by providing offsets. This spread is known as footing and the foundation itself is called spread footing. In some cases, however, the bottom course is made 20cm deep. In the case of footing for store walls, the size of offset is slightly more than that of the brick wall footing. For constructing wall footing, a bed of lean cement concrete (1:8:16) is first laid over the entire length of the wall. The thickness of this lean concrete bed is usually kept 15cm and its width is kept 20 to 30 cm more than that of the bottom course. In no case, the depth of the concrete bed should be less than its projection beyond the wall base. For foundations over firm soil or compacted ground, the concrete bed below the brick wall footing may be dispensed with. After laying the concrete for constructing the concrete bed, it should be properly compacted and cured before laying the base course of the wall. This is the cheapest type of spread footing foundations and is largely used for walls of ordinary buildings. Isolated footings are used to support the individual pillars and columns constructed in brick or stone masonry. They are stepped down in the wall footing after providing 15cm offset of foundation concrete on all the sides. These are either stepped type, slate type or slope type, having projections in the vae concrete. To support heavy loads, reinforcement is also provided at the base. The reinforcement provided is in the form of steel bars and is placed in both directions. Concrete column footings may be either isolated footings or combined footings. Isolated footings are used to support the individual columns, whereas combined footings are used where projections of different columns are not possible on all the sides, due to limited space. 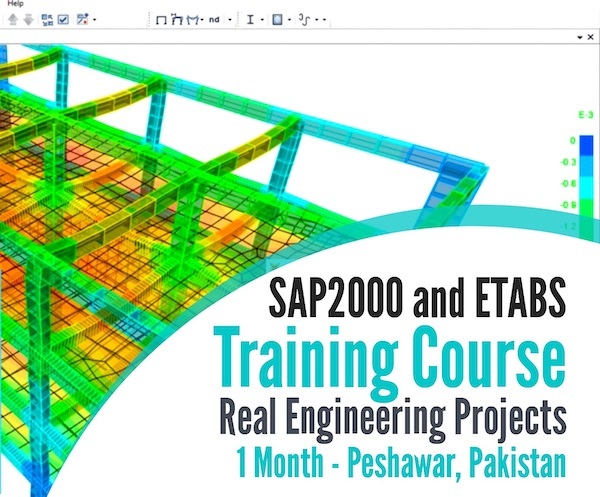 The combined footings are generally rectangular in shape when both columns are of same sections and trapezoidal in shape when the columns are of different sections. The foundation which consists of one or two tiers of wooden or rolled steel section with space filled up with concrete is known as Grillage foundation. This is so called because the bed constructed in this type of foundation is called grillage. This type of construction avoids deep excavation and provides the necessary area at the base of the structure to reduce the intensity of pressure within the safe bearing capacity of the soil. The object of this type of foundation is to spread the load over a large horizontal area at the base of a structure. Depending upon the material used in construction, grillage foundations are further classified into two types. For constructing steel grillage foundation, a trench is excavated to the calculated width and about 0.90 m - 1.50 m deep. Bottom of the trench is rammed and leveled. Then a layer of lean cement concrete (1: 8 : 16), about 30cm thick, is laid and compacted. After this, a layer of rich cement concrete (1: 2 :4 ), about 15cm thick is spread and compacted to form a concrete bed. Over the concrete bed thus prepared, the bottom tier consisting of a number of steel I - beams of designed dimensions are placed at specified distance apart, using spacer bars. The space in between and around the steel beams is then filled with cement concrete. On this bottom tier, a second layer of steel I - beam is placed, if required. The entire space is then filled with cement concrete 1: 2 : 4. On the grillage bed thus prepared, the structure in the form of a steel stanchion, column, pier is built. Wooden planks, usually 5 to 8 cm in thickness, are laid side by side longitudinally on the prepared bed of the trench excavated for this purpose. The planks should be arranged in a width 45 to 60 cm more on either side than the designed width of the base course of the structure. On this bottom layer of planks, rectangular timber sections of suitable size are laid at about 35 cm center to center. On the timber platform thus prepared, the structure in the form of a timber column or even a masonry wall is built. Steel grillage foundations are useful for structures like columns, piers, stanchions subjected to heavy concentrated loads and hence are employed for foundations of the buildings such as theaters, factories, town, halls etc. Timber grillage foundations re usually provided for timber columns subjected to heavy concentrated loads. This type of grillage foundation can also be safely used for light buildings where the soil encountered is soft and is permanently water-logged. 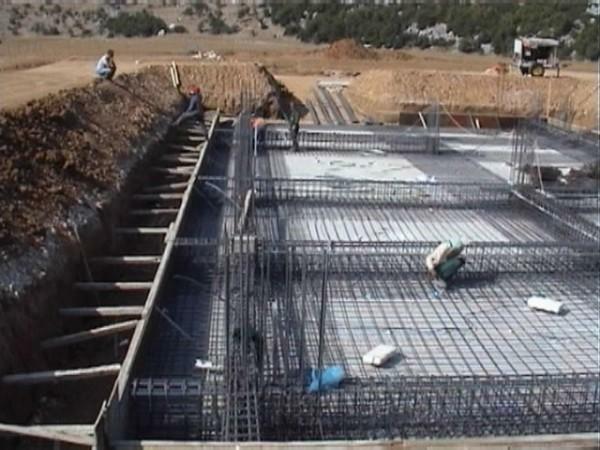 The foundation consisting of a thick R.C.C slab covering the whole area of a mat is known as raft foundation. In Raft Foundation construction the whole area is dug out to the specified depth and 30 cm more wide than the area to be covered. The bed is compacted and sprinkled over with water. Then a layer of lime concrete or lean concrete ( 1: 8 : 16 ) is laid to a suitable thickness to act as a bottom cover. After this, the reinforcement is laid. The reinforcement consists of closely spaced bars placed at right angles to one another. Then the cement concrete (1 : 2 : 4 ) is laid and compacted to the required thickness. When loads are excessive, thick concrete beams running under the columns can also be constructed. This type of foundation is useful for public buildings, office buildings, school buildings, residential quarters etc, where the ground conditions are very poor and bearing power of the soil is so low that individual spread footing cannot be provided. Another types of foundation is stepped foundation, For Stepped Foundation Construction, excavation is done into steps having short length and uniform thickness and the masonry work is done on the horizontal bed of concrete thus prepared. If there is any possibility of slipping of the structure bodily, R.C.C piles can be driven along its base concrete on the sloping side. The foundation consisting of inverted arches between the piers is known as inverted arch foundation. In this type of foundation, the load from the piers is transferred to the soil by constructing arches in inverted position at their at their base. The rise of the inverted arches is about one - fifth to one - tenth of the span and they are usually build in half-brick rings. The position of arches may be either along the row of piers or across the row of piers in both the directions depending upon the nature of soil and the type of land to be taken by them. Excavation is done to the required depth. Then the foundation concrete is laid to the required thickness and finished according to the layout of the arches to be constructed under the piers. The arch rings, usually half brick thick, are then built in cement mortar and piers are constructed. The end piers should be designed and constructed to take the outward thrust caused by arch action. This of foundation is not commonly used for buildings, but it is quite suitable for other structures like bridges, reservoirs, tanks, supports for drainage lines etc. 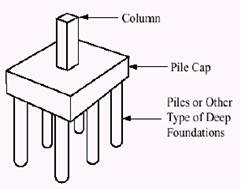 A foundation (spread footing or grillage) supported on piles is called a pile foundation. A pile foundation usually consists of a base of spread footing or grillage supported by piles at their bottom. Piles distribute the load of structure to the soil in contact either by friction alone or by friction combined with bearing at their ends. When the soil is very soft and solid base is not available at a reasonable depth to keep the bearing power within safe limits. When the grillage and raft foundation are very expansive. When the building is very high carrying heavy concentrated loads.